From fruit and vegetable markets to craft markets to flea markets, Lisbon really does have some great markets. 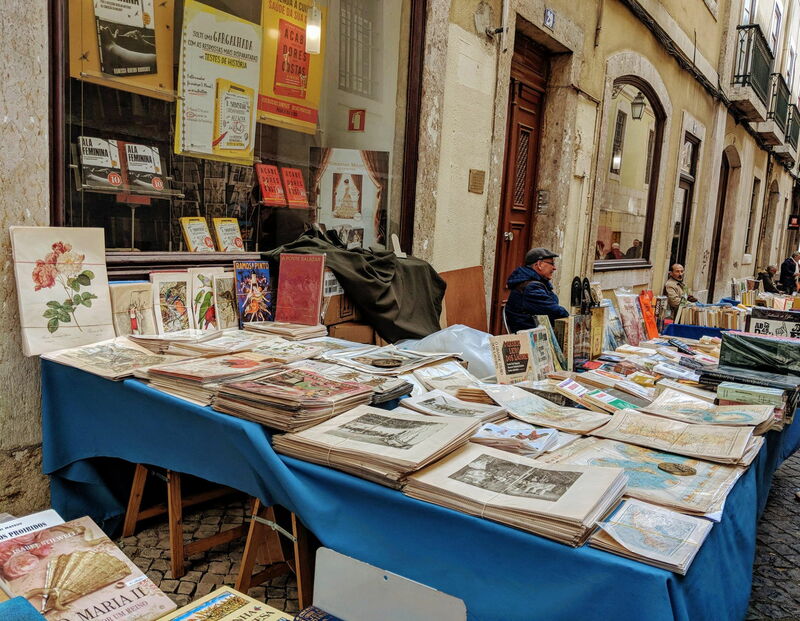 So, whether you’re looking to pick up some fish for dinner, a handmade gift for someone’s birthday, or a Portuguese language book to help you get to grasps with the language, there’s a market in Lisbon that’s just right for you. Mercado da Ribeira is the largest market in Lisbon. 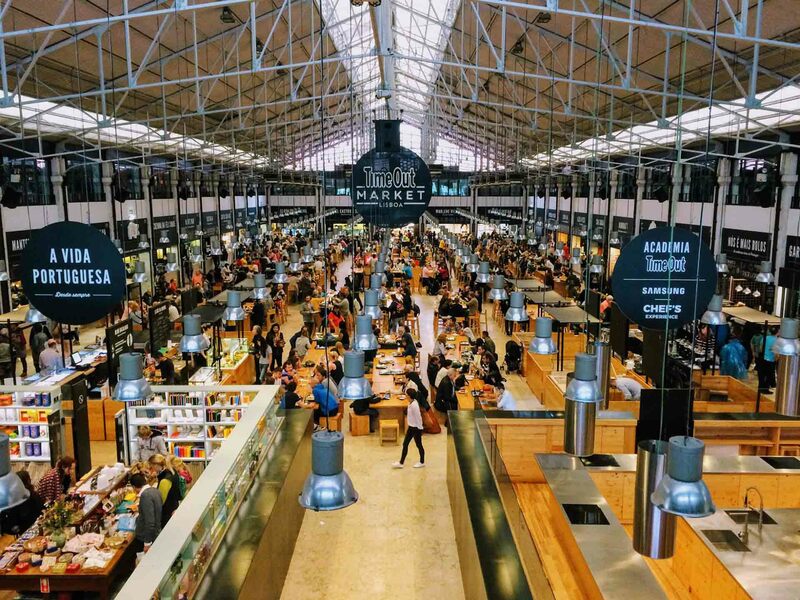 Although most people know if for the Time Out Food market, which is the largest food market in Lisbon, it’s also home to one of the largest fresh food markets in the city as well. 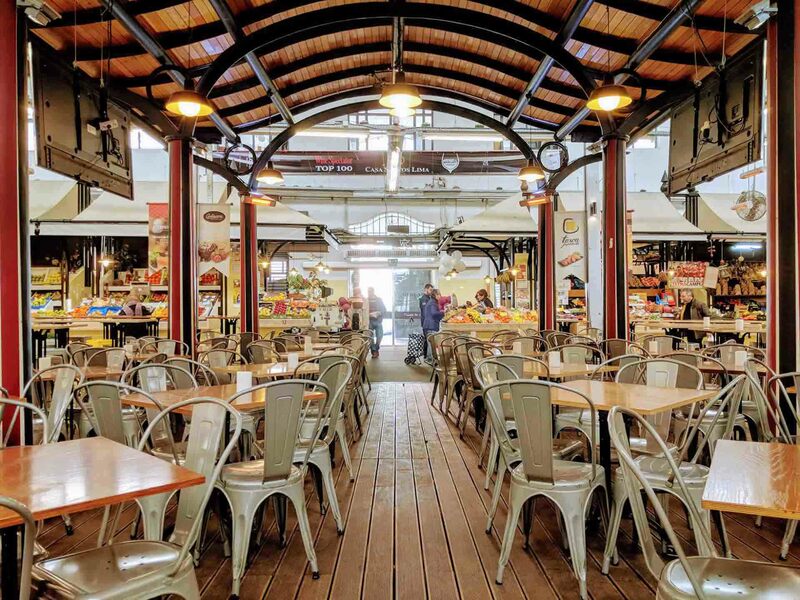 Despite being in the city centre, and despite being next to the Time Out Market, the Mercado da Ribeira hasn’t fallen into the trap of becoming an expensive farmer’s market. Instead, it’s a very affordable daily market that sells just about everything that’s on your shopping list. Fruit, vegetables, fish, meat, chillies and spices can all be found here in one of Lisbon’s most famous markets. If you haven’t shopped at a Portuguese market before, why not? It can be easier to go to the supermarket sometimes, yes, but you’ll usually pay more and the quality won’t be anywhere near as good. The Time Out Market is the largest food hall in Lisbon, and it brings together some of the best bars and restaurants all under one roof. Many of Lisbon’s most popular restaurants have a stall here, and it’s a fantastic place to sample a single dish from these restaurants without having to order an entire meal. Mercado 31 de Janeiro is one of Lisbon’s many markets, and this one is particularly known for its fish and seafood selection. 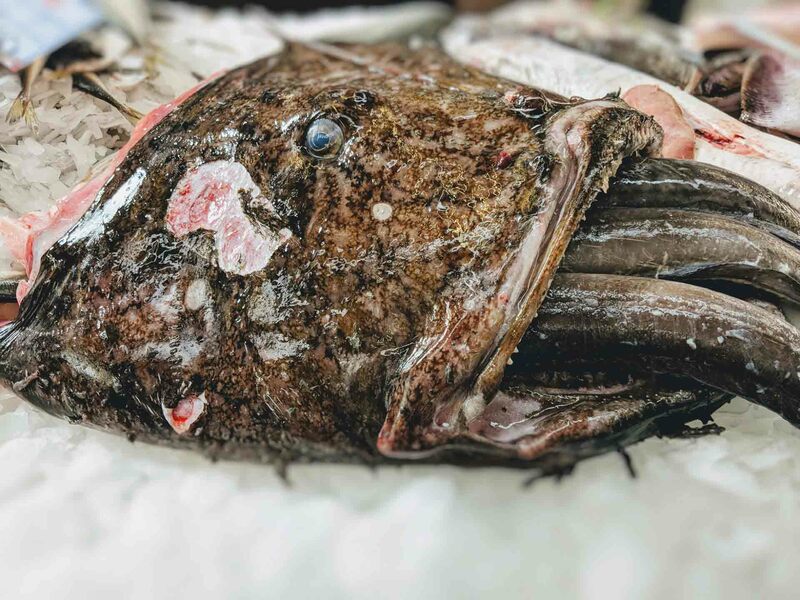 If you’re looking to buy good quality fish, this is one of the best places in Lisbon to do so. The market’s restaurant is also worth a visit, and you’ll struggle to get a better piece of grilled fish anywhere in Lisbon. The Time Out Market is Lisbon’s largest “street food” market, and it’s most famous, and that’s ultimately become its downfall: food prices have risen rapidly in here over the past few years, and the venue can get extremely busy. Few people, particularly those visiting Lisbon, know about Time Out’s sister market, Mercado de Campo de Ourique. Like the Time Out Market, this is both a fresh produce market and a food market but on a much smaller scale. But, even though it’s smaller, the produce market is more than big enough for anybody, and the food market has quite a few food stalls to keep most foodies entertained for a few visits. If you like to shop organically, the best place to head is the Biological Market in Principe Real. This small weekly Saturday market takes place between 9 am and 3 pm, and attracts vendors from all over Portugal who sell fruit and vegetables, herbs, soaps, olive oil, and healthier takes on traditional Portuguese cakes and sweets. It’s particularly popular with vegans, vegetarians, and health-conscious locals. Principe Real is one of Lisbon’s most beautiful neighbourhoods, and this is a great excuse to venture up here and see this part of Lisbon. The Feira da Ladra flea market is Lisbon’s longest running market, and some historians believe it may even go back as far as the 12th Century. It’s a great place to find antiques, old books, coins, furniture, vintage clothing, artwork – anything really. The Feira da Ladra takes place every Tuesday and Saturday between 6 am and 5 pm in Campo de Santa Clara in Alfama. The LX Factory is one of Lisbon’s most popular attractions. Formerly an industrial part of the city, the buildings here have been transformed into a hipster’s paradise of coffee shops, boutique shops, restaurants, and co-working spaces for Lisbon’s many digital nomads. One of the best days to visit the LX Factory is on Sunday when the weekly boutique clothes, crafts, jewellery market takes place. Many of the clothes are vintage, and there’s plenty of second-hand treasures to be found as well. The market takes place on Sunday between 11 am and 6 pm. On Sundays, there’s LX Rural: a small fruit and vegetable market, which takes place between 9:30 am and 4 pm. The Anjos flea and craft market is one of the largest creative markets in Lisbon. If you’re looking for vintage clothing, artwork, homemade jewellery, accessories, and homeware, this is the place to come to. The Anjos70 market takes place on the first weekend of every month, except for the months of January and August, between 11 am and 7 pm. The market is located at 70 Regueirão dos Anjos. The Feira de Alfarrabistas is a weekly second-hand book market that place in Chiado on Rua da Anchieta. You’ll find a mixture of second hand books here, from simply second-hand to antique and valuable books, along with old maps, comic books, old newspapers, and vintage postcards. The Feira de Alfarrabistas market takes place on Saturday between 10 am and 5 pm. Martim Moniz Square is an interesting multicultural part of Lisbon that’s the focal point for Lisbon’s international communities. Here, you’ll find several food stalls selling sushi, Portuguese food, Asian food, African food and cocktails. On a warm day, it can be quite a nice place to sit and enjoy the views of São Jorge Castle over a coffee or a caipirinha.